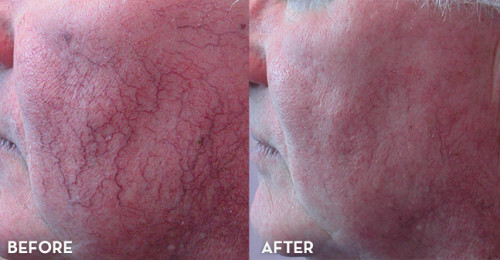 Facial spider veins are twisted purple, red, and blue vessels seen typically on face and legs. This vein abnormality is similar to varicose veins. The only difference is that varicose veins are raised, larger, and swollen blood vessels with lots of turns and twists whereas spider veins are smaller. Both of these occur due to structural abnormalities of blood vessels. Facial spider veins are clusters of tiny blood vessels that are close to skin surface and often resemble spider web. Today millions are interested in getting rid of spider veins. Usually spider veins do not cause any serious health complication. Some might develop skin ulcers due to spider veins. They can be a big beauty concern due to their not-so-pleasant appearance. There are numerous treatments that can resolve spider veins, such as laser therapy, sclerotherapy, radiofrequency ablation, endovenous laser and vein surgery. If condition of your veins is not so bad to develop health complications, you can easily get rid of them using many natural home remedies. Let’s have a close look at some of them. Gingko biloba is very useful in strengthening tissues that form vein walls. Sometimes extensive exposure to sunrays and use of cosmetics or creams can weaken the walls of veins and may also damage the vein valves, resulting in chronic venous insufficiency. Although facial spider veins are not categorized as a chronic venous insufficiency that needs emergency medical intervention, ginkgo biloba can surely help widen them, thereby relaxing blood vessels in body to regulate blood flow. It also improves tissue oxygenation apart from boosting blood circulation. This makes gingko biloba an excellent remedy for spider veins. You can use gingko biloba extract (preferably 50:1) made from the veins of the herb because it gives you the most medicinal value. You just need to take 100-130 mg of this extract daily, divided into three to four doses. To start with, take 30 mg of gingko extract thrice a day. It’s one of the easiest ways of getting rid of spider veins and is quite effective too. It diminishes the appearance of spider veins by improving blood supply around the affected area. You need some apple cider vinegar and a clean cloth. Soak the cloth with some apple cider vinegar. You can now use it as a compress on your affected area. Let it be there for about 20-30 minutes. Repeat this 3-4 times for at least two months. Continue doing this after a monthly if you still see some spider veins and repeat this till all of them disappear. Horse chestnut seeds are rich in tannins and saponins and have good circulatory and anti-inflammatory effects. They are a best remedy for itching, swelling, pain, and fatigue associated with tensed spider veins and varicose veins. This is the reason whey horse chestnut veins can strengthen veins that has lost their elasticity. Many clinical studies in the past have shown that they improve blood circulation in the body and reduce inflammation along with strengthening veins and capillaries. Take about 12 tbsp of distilled witch hazel and add 1 tbsp of horse chestnut tincture to this. Now mix it and apply it to the area with facial spider veins. Witch hazel can also be beneficial incurring spider veins. It has astringent properties can help cure spider veins. Many studies conducted on animals have shown that witch hazel also strengthen blood vessels. Dip a small cotton ball in a witch hazel solution. Apply this on the affected area. Repeat this several times until you get rid of your facial spider veins. Bilberry can also help you in getting rid of spider veins within a short time. It has been traditionally used to treat mouth and throat inflammations, diarrhea, eye problems, diabetes and poor blood circulation. This unique property of bilberry to improve blood circulation can be very helpful in getting rid of spider veins. It is also rich in proanthocyanidins, tannisns, phenolic acid and flavonoids. Its good antioxidant properties protect your veins from damage due to free radicals. Aside from improving blood circulation, bilberry also strengthen blood vessels. Take just 30 milligrams of bilberry extra two to three times a day. Use the extract that has 30-40 mg bilberry and 25 percent of anthocyanidins. Do not use this extract for more than 6 weeks. If you’re taking blood thinning medications, or anti-inflammatory drugs, avoid taking bilberry. Ginger is a common herb used in kitchen and can help you get rid of facial spider veins. A blood protein called fibrin may build up in areas where your veins get injured. This makes your veins more prominent and visible. Ginger can easily break up fibrin and reduce spider veins. Ginger also boosts blood circulation by reducing blood pressure. Low blood pressure will exert minimal pressure on your veins. Ginger also has blood thinning effects that makes it easier for your heart to pump blood. For best results you can have a ginger tea 2-3 times a day. I don’t usually review products but have to this time for DermalMD Varicose veins Serum. I had several spider veins on my face next to my nose – and I say had! In just 3 weeks 5 are gone and the few that were the worst ones are much better and I’m sure will be gone shortly.